Even the pros have to get off their bike sometimes! We're just weeks away from the big one - the World Championships in Hawaii! Triathletes are flying in from all over the globe to soak up the atmosphere, acclimatise to the tropics, and take part in the ultimate event of their season. Although for anyone who *happens* to be out racing the iconic Ironman... XTERRA is just two weeks later, and did you know you can contest the Ironman/XTERRA 'Double' championship? Elite and Age Group athletes can compete for the fastest combined times on Kona and Maui. One for those of you with a penchant for VO2Max intervals, as well as endurance suffering! But for those who haven't heard of it - what is XTERRA, and why should I try one? The name is just a brand, and it's the most popular worldwide series of off-road triathlons. The World Tour consists of European, American and Asia-Pacific series, plus events in Canada, South Africa, even as far-flung as Tahiti and Costa Rica! The biggest difference from 'normal' triathlon is that the cycling stage is on mountain bikes - no skinny tyres allowed! Not all the courses are super-technical (although some can be!) However don't let being new to mountain biking put you off giving it a try. There is no problem getting off and walking any obstacles you are not comfortable with - you won't be alone and it is certainly not looked down upon. Even the pros have to get off sometimes, and even they were beginners once! The entire atmosphere is very supportive - there is mutual respect between everyone willing to take on the technical challenge. 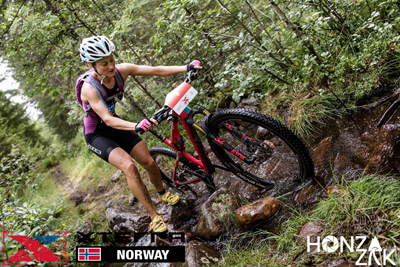 In feel, the sport is a cross between adventure racing and triathlon. You will often hear reference to the 'Xterra family' because of the camaraderie, and the fact it's a smaller world than road triathlon. This makes the racing less stressful, because even at the biggest races (South Africa, France, Maui...) there are perhaps 800-1000 athletes in the main race. No need to rack your bike the day before, no huge queues for portaloos, and no need to be in a start pen 20 minutes before the gun! It's a much more chilled out approach. And with that, there is much less room for egos, attitudes, posing and posturing! 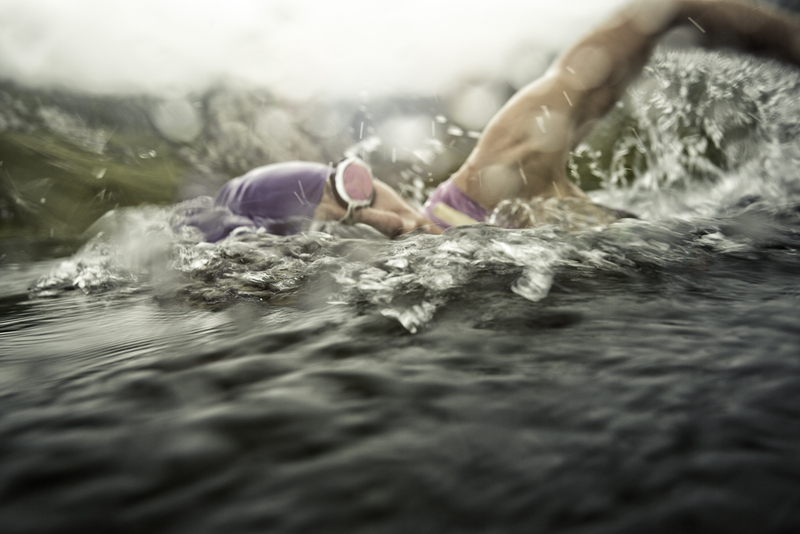 The XTERRA race distance is similar to Olympic triathlon - 1500m swim, 30-40k bike and 10k run. However don't be fooled (as I was) into thinking you'll be done and dusted in a little over 2 hours! On some courses you could spend 3+ hours just on the bike - when there is often over 1000m climbing, along with mud, roots, rocks and technical features that will slow you down. Drafting is allowed, but it rarely has much benefit and often you need to leave a gap between wheels in order to see the trail ahead and react to obstacles. Mountain biking is quite an adventure sport in any country - anyone can ride down a straight bit of tarmac, right?! But there's a lot more fun, adrenaline, and sense of satisfaction making it in one piece down a slippery ski slope, through rock gardens, round sweeping berms and flying along sweet single-track. It's also a lot more enjoyable to train away from the road - a great option for winter, even if you only plan to race on the road. For me, this is actually the biggest reason I switched to off-road triathlon as I got fed up of taking my life in my own hands whenever I had a bike session to do. After several accidents at the hands of careless drivers, and too many near misses to count, I felt it wasn't worth the risk anymore. If I fall off my MTB or hit a tree, it is almost certainly my own fault, whereas on the road I'm at the mercy of other people's mistakes. As someone who is also slightly OCD about pollution, I also prefer to do my hard workouts in the clean air of the forest, instead of breathing in lungs full of dirty diesel emissions midway through my killer hill reps! The other awesome part of off-road racing is the venues. I have been fortunate to race in what must be some of the most stunning locations on earth! If you feel invigorated by unspoiled nature, then this is another selling point of XTERRA! The races are rarely held in cities - often they could be in the middle of nowhere, with bike trails heading up some remote mountainside to stunning yet rarely seen views. You have to be careful when recce-ing the courses though, not to get lost! Because some of the races are out in the countryside, often camping is the best option for accommodation. You may find entire campsites become like a race village, for example in France, Switzerland and Germany. XTERRA is a rewarding challenge, but it's definitely one for the tough athletes, not for the faint hearted!